What comes in a Kit? : Beading Patterns and kits by Dragon!, The art of beading. Home About Patterns & Kits What comes in a Kit? 99% of the time the kits are made with the same beads that the original piece was made with. I bead with Czech and Japanese Beads so that is with is in the kits. There are no instructions with a kit JUST BEADING STUFF. 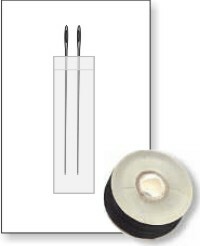 This kit would include the beads indicated. In separate little bags as shown. 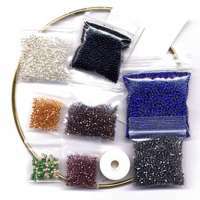 Beads that have a count less than 30 may be mix together in a small bag. In this kit the Green, Lime and Blush are mixed in one bag. This kit would also include a 5" ring, 2 needles and a bobbin of thread. Some kits, like bracelets and earrings come with a thread card and a needles. You will find the needle under the thread, taped to the card. You can pull the needle out from under the thread when you start your project. Some kits come with 2 needles taped on the back of a business card and a bobbin of thread. A very few of the patterns require 2 needles. We include the extra needle to most of the patterns, as they can bend, break or just become too hard to thread.